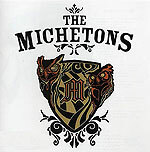 Based in the Bay Area, the five-piece Michetons play a fun, rocking mixture of punk, ska and pop on their five-song debut EP. The opening track, "Game of Chess," combines power guitar chords with smoothly harmonized lead vocals over a beat that has a slight Caribbean hitch to it. "Move Me" has more of an '80s feel to it. And while the label is pushing the fourth track, the slick, melodic "Separate," as the band's featured song, in truth they really hit their stride on "Radio." With a slowed-down tempo and a can't-miss theme, the song's arrangement is equal parts alt-rock passio and professional polish  the sort of power ballad that always seems to find a place on the airwaves in every decade.